Sheldon, sitting like a crown on a ridge may not be a recumbent stone circle as no recumbent stone exists but the circle is about the right size for one. 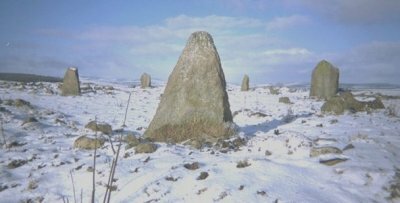 Five tall stones form the circle plus two more outlying stones a few metres beyond. To reach this circle there are plenty of buses from Aberdeen to Old Meldrum, or drive from Aberdeen on the A947. Take the back road west at Longside Farm a couple of miles south-east of Old Meldrum. Sheldon Farm is a mile further on. Ask permission at the farm to go to the circle, which is at the top of a field on a slope behind the farm. From here it's not far to Kirkton of Bourtie where the keen-sighted can look for the near-invisible Pictish stone. A tree lined drive leads down to the kirk into which the stone is built high into the outside of the south wall (at top right). I could only see it with binoculars, making out a finely carved but fragmentary disk and crescent, near the roof and obscured by a pine tree.